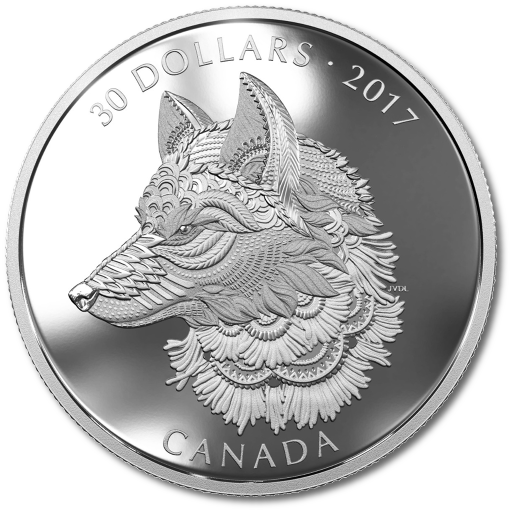 The 2017 2oz Zentangle® Art Great Grey Wolf silver coin is another thrilling first for the Royal Canadian Mint. And, of course, you can be among the first to own one of these magnificent silver coins when you order online with coininvest.com. Each limited-edition coin contains two troy ounces of .9999 silver and features the inimitable Great Grey Wolf. The Royal Canadian Mint is well-known for premium collections based on the animals that roam the country's vast wilderness regions such as the Canadian Wildlife Series of silver bullion coins and the superb Call of the Wild Series of gold coins. This new 2oz 2017 Zentangle® Art silver coin celebrates the Grey Wolf (Canis lupus),an animal that has inspired writers and artists for centuries. No other creature captures the sense of the wilderness so well; the beautiful alpha wolf approaches silently and its echoing cry can be heard for miles as it calls to its pack. This innovative coin partners the traditional image of the wolf with an exciting art technique. Zentangles are created by combining a series of miniature structured patterns. Every individual pattern is a work of art but, when joined, the curves and intricately etched lines capture the Grey Wolf in amazing detail. Talented Canadian artist, Jori Van der Linde has chosen to show the wolf facing slightly to the side so that the full beauty of its pointed snout and luxurious fur can be appreciated. Why buy the 2oz 2017 Silver Zentangle® Art Grey Wolf Coin? The Zentangle® Method was created by Maria Thomas and Rick Roberts and it perfectly illustrates the legendary skill and expertise of the Royal Canadian Mint's master engravers. This outstanding 2oz Grey Wolf Zentangle® Art Silver Coins measures 50 mm in diameter and is sure to be the focal point of any collection. CoinInvest enjoys finding the most exciting products for its customers – like this beautiful 2017 2oz Zentangle® Art Grey Wolf silver coin. Each coin is supplied in a collector's box.